The Eckerd College Dolphin Project (ECDP) was initiated in 1993 to conduct research on bottlenose dolphins (Tursiops truncatus) in Tampa Bay. The project was started by Dr. John Reynolds and is now led by Dr. Shannon Gowans and Dr. Peter Simard. 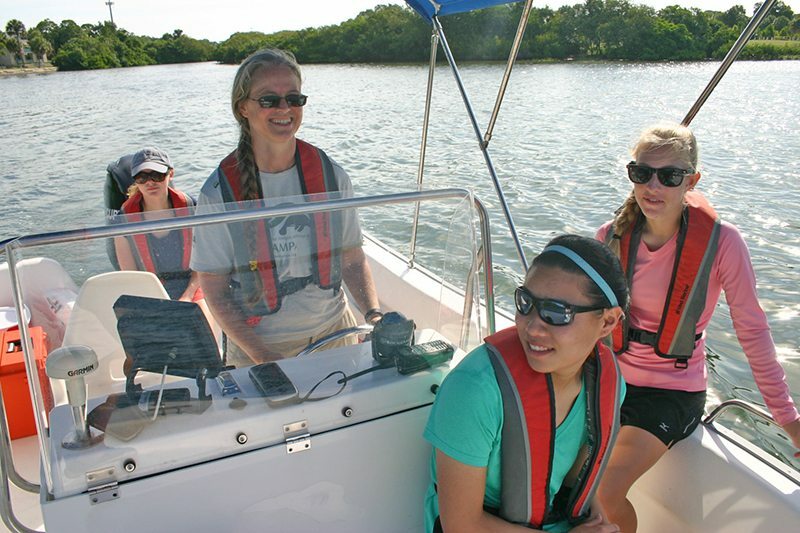 Multiple students work year-round on a variety of projects investigating questions about the population, social structure, ecology, distribution and acoustic behavior of bottlenose dolphins. Train undergraduate students in marine mammal research techniques. We use a combination of traditional and cutting-edge techniques in the field in and in the lab, including photographic identification, population modeling, digital image recognition and autonomous acoustic recording technology. Many of our students have gone on to graduate school and now have research, faculty, conservation or management positions. Conduct scientific research on bottlenose dolphins in Tampa Bay. Our work contributes to the scientific understanding of bottlenose dolphins in Tampa Bay, as well as more general scientific questions regarding other marine mammals, marine ecology, marine acoustics and conservation. Much of our research has been presented at local, national or international conferences, and published in peer-reviewed scientific journals. This work is also essential to effectively manage coastal populations. Photos above and below taken under the authority of NMFS LOC No. 15512.o. Cupid is one of Eckerd’s “resident” dolphins. Her unique fin markings make her easy to identify. She was first observed by the ECDP on January 6, 1997, and since that time has had at least three calves. Research by Kim McCallister (Marine Science, 2011) showed that Cupid was found to have a very small home range of only 22 square kilometers (about 8.5 square miles). "My dolphin research was developed into a first-author peer-reviewed publication, garnered me a nomination to the Sigma Xi research community, provided me with acoustics experience that I continue to build off of today. I am currently a Ph.D. Candidate with the University of Queensland in Brisbane, Australia, investigating the sound production of humpback whales, a position that I would not have been competitive for without the experience I gained through my work with the ECDP." 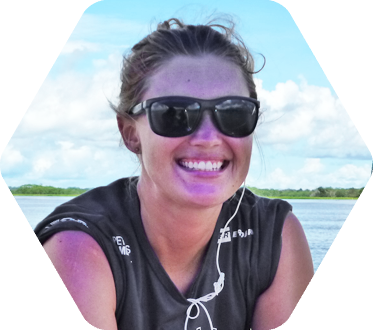 "During my time with ECPD I gained the skills and experience with photo-id, acoustics and data analysis that led me to a year in Brazil working as the main researcher for a long-term project studying Amazon River dolphins and a master's degree from Winthrop University on the social sounds of Amazon River dolphins. I am now a research assistant at Pacific Whale Foundation, working on marine mammal projects in Hawaii and Australia." 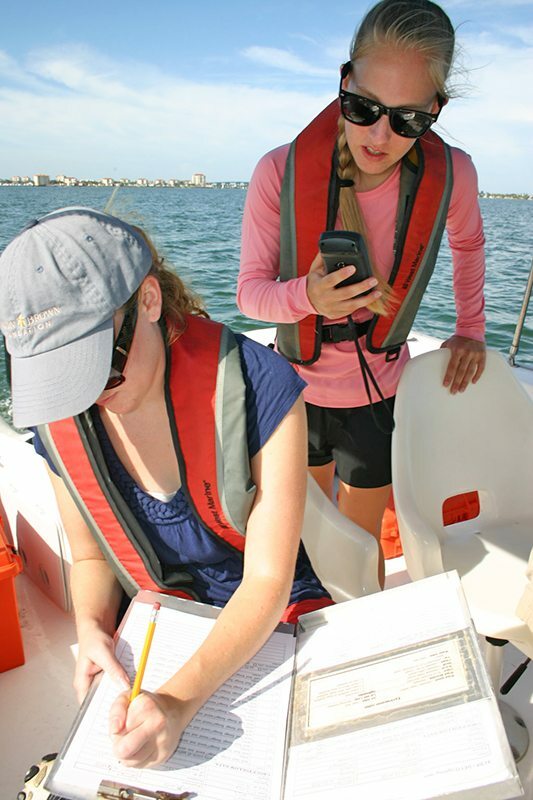 "I worked on the spatial relationship between dolphin calves and ambient noise levels in Boca Ciega Bay. I gained valuable sound analysis skills that I now use in my graduate studies. I am currently earning my Master's degree at UC Santa Cruz, where I am characterizing Hawaiian monk seal vocalizations. ECDP increased my knowledge of bioacoustics and allowed me to create relationships with mentors and students that share a common interest in marine mammals. I now have a Fulbright fellowship to study bioacoustics at the University of Southern Denmark." "My favorite memories with ECDP include: three summers on the water collecting photo-ID and acoustic data on resident bottlenose dolphins in Boca Ciega Bay and Tampa Bay, a winter term semester in New Zealand monitoring effects of ecotourism on marine mammal populations, presenting student research at local and international professional conferences, collaborating on various research publications, and defending my own undergraduate senior research thesis in 2011." "As a member of the ECDP during 1996-1998, I gained extensive hands-on field experience. I learned many valuable skills, including driving small boats, conducting focal follows of dolphins to collect detailed observations on behavior and habitat use, taking high quality photographs, utilizing GIS technology, and analyzing complex data sets. 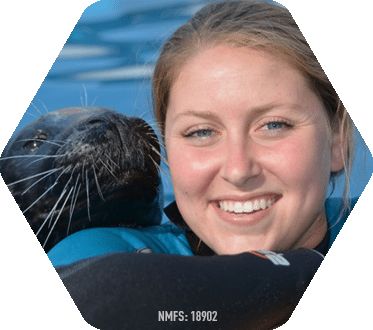 I carry my ECDP experiences with me every day, and am grateful for the solid foundation they gave me to become a professional marine mammal biologist, wildlife conservationist, and emergency response coordinator." Bottlenose dolphins (Tursiops truncatus) are a familiar sight to many, as they are the most common species of dolphin portrayed in the media and kept in captivity. 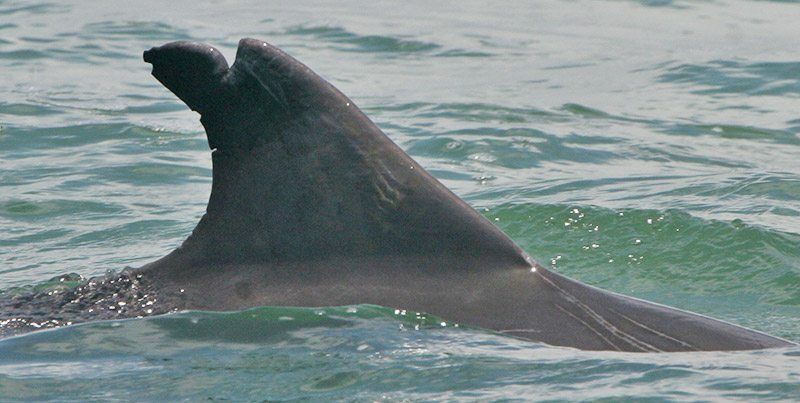 Bottlenose dolphins have a wide distribution (as far north as Iceland and Norway, as far south as New Zealand) and are a common sight in Tampa Bay waters. They are light grey in color and about 8′ (2.5 m) in length (although their size changes greatly from place to place). The ubiquity of the bottlenose dolphin hides the complexity of these animals. For example, in our study area, some individuals are seen only rarely and are likely only transient visitors, while other individuals are highly resident and spend their entire lives here. Some individuals have preferences in how they hunt for fish, such as our resident “seawall feeders”- individuals that hunt cooperatively by herding schools of fish against seawalls and take turns darting into the school to feed. For more information, see some highlights of our research, below. Calf and mother interact. Photo taken under the authority of NMFS LOC No. 15512.o. The project is overseen by Dr. Shannon Gowans (Marine Science and Biology) and Dr. Peter Simard (Environmental Studies). Dr. Shannon Gowans earned her bacheolor’s and her Ph.D. degrees from Dalhousie University. Her work focuses on the social organization and population structure of dolphins societies. Dr. Peter Simard has a bachelor’s degree from Dalhousie University and a Ph.D. from the University of South Florida. 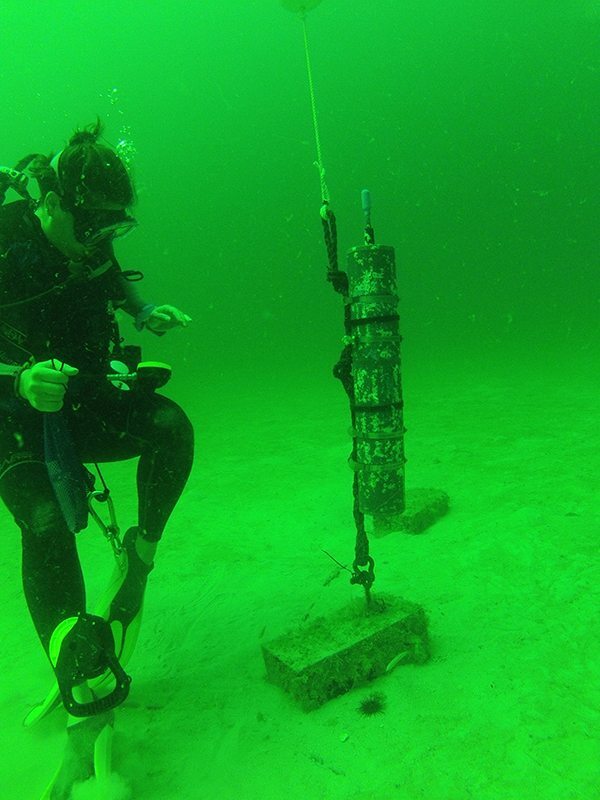 Dr. Simard specializes in dolphin ecology, temporal-spatial distribution and acoustics. 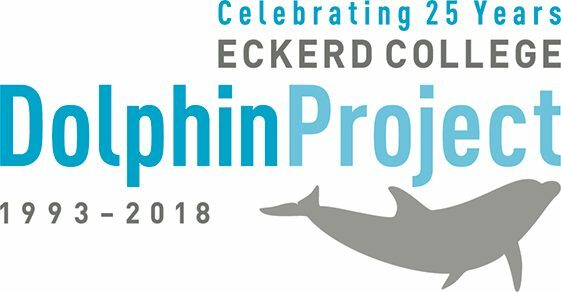 Eckerd College students work with the Dolphin Project as interns, students, or summer research staff. All students work closely with Dr. Gowans and/or Dr. Simard. Throughout the year, volunteer interns assist with a variety of research projects. There are also opportunities for completing independent studies or senior theses. In the summer we hire several students as full-time research staff. All team members work both in the field and in the lab, and many have the opportunity to present their research at conferences or have their research published in scientific journals. 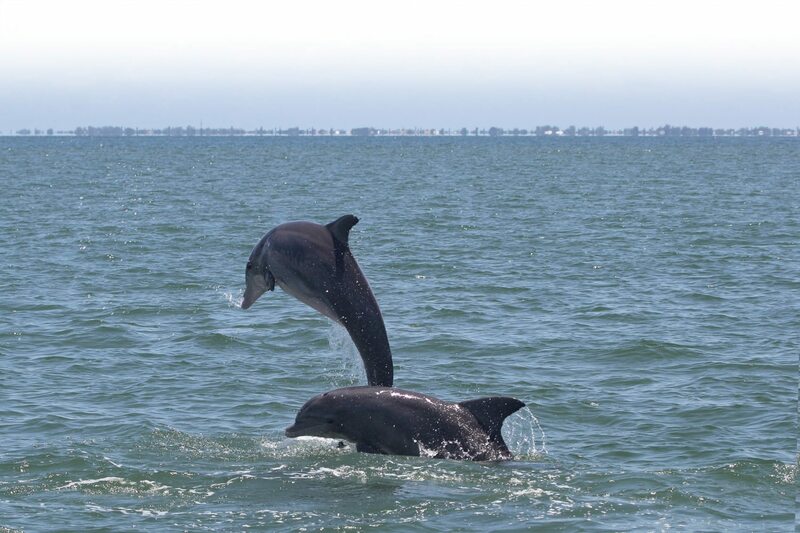 Our research mainly focuses on the population dynamics, ecology and acoustics of bottlenose dolphins in lower Tampa Bay (including Boca Ciega and coastal Gulf of Mexico waters), although work on other species and in other areas occurs from time to time. Data resulting from the project can provide insight into questions regarding dolphin abundance, distribution, reproduction, stock discreteness, habitat use, and behavior. It is important to investigate these basic questions in order to contribute to general knowledge regarding the biology, ecology, and behavior of dolphins, and to aid in the making of informed conservation and management decisions regarding dolphins and dolphin habitat. Field work is conducted on small boats, and data collection includes distribution and group composition of bottlenose dolphin groups, photographic identification, acoustic recordings of groups and the servicing of several autonomous acoustic recorders located throughout the study area. Lab analysis of photo-identification data involves computer-assisted dorsal fin matching with the computer program DARWIN (developed by the Eckerd College Computer Science department) and social organization analysis software (SOCPROG). 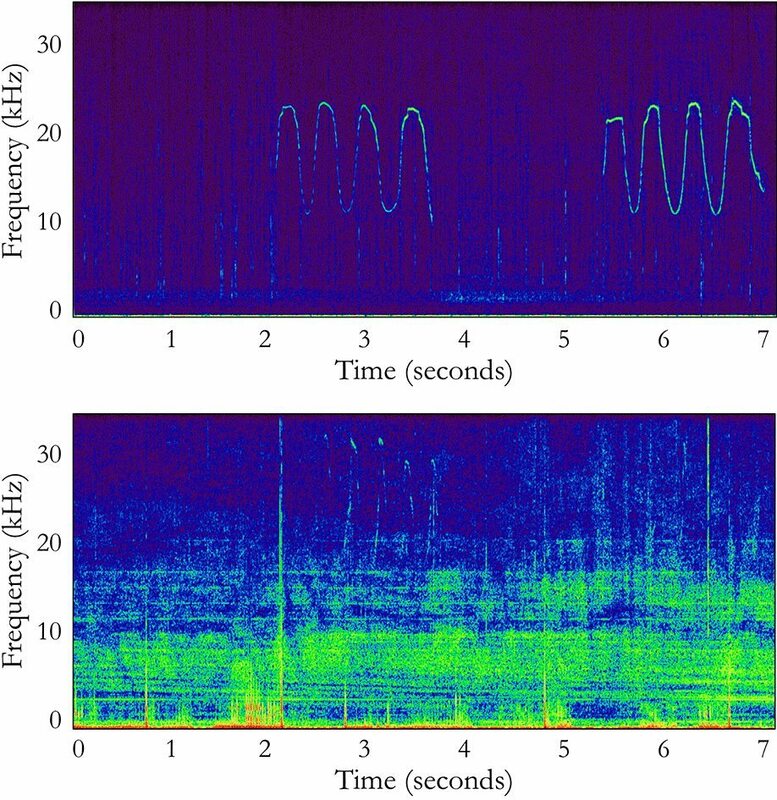 Acoustic analysis involves the use of spectrogram analysis software (Adobe Audition and Raven) and custom-written analysis algorithms (MATLAB). Photo above taken under the authority of NMFS LOC No. 15512.o. Map showing the location of the Deepwater Horizon platform (yellow circle) in relation to Tampa Bay. Modeled oil spill trajectories shown in various colors ranging from light grey (May 28, 2010) to black (July 18, 2010) using WFS ROMS and SABGOM ocean circulation models. Blue lines show bathymetry (water depth). Oil spill spatial data courtesy of Conservation Biology Institute, landform data courtesy of Florida Fish and Wildlife Conservation Commission, bathymetry data courtesy of U.S. Geological Survey. 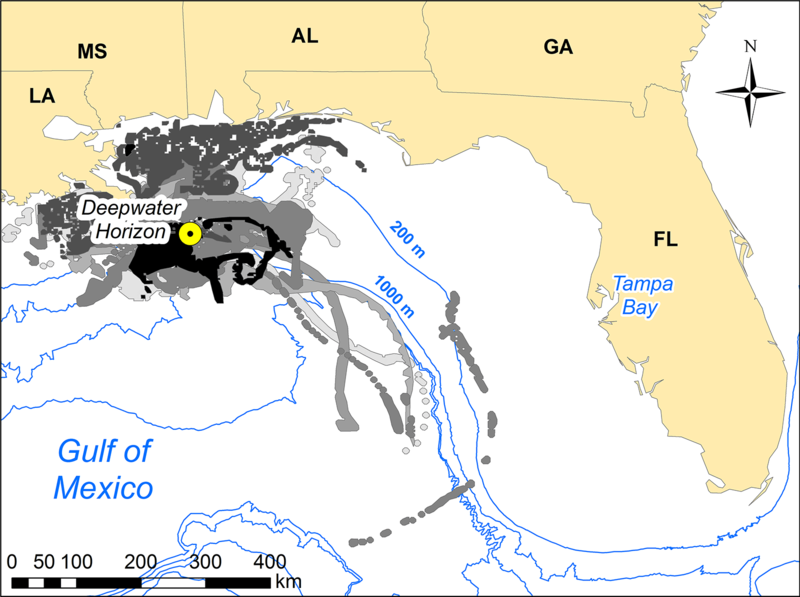 The Deepwater Horizon oil spill took place on April 20, 2010 in the northern Gulf of Mexico, approximately 350 miles (570 kilometers) WNW of Tampa Bay. While much ecological damage was observed in the vicinity of the oil spill, the monitoring of downstream ecosystems such as Tampa Bay are also important. 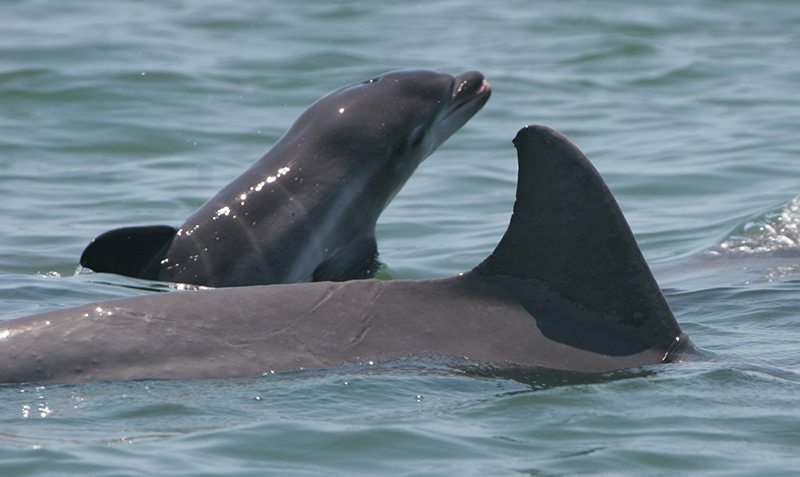 In order to assess the potential effects of the oil spill on the bottlenose dolphin population in Tampa Bay, the Dolphin Project analyzed group size, sighting rate and the rate of identifying new individuals before and after the oil spill. Our results indicated that sighting rates increased significantly after the oil spill, and a higher number of new individuals were identified in 2010 (the year of the spill). While we cannot determine if these changes were the result of the oil spill, long term monitoring of populations is essential to examine changes over time. This research involved Eckerd freshmen Amelia Fogelman, Carlyn Haas, Jeffrey Michaelic and Meredith MacQueeney and was presented at 2016 Gulf of Mexico Oil Spill & Ecosystem Science Conference (Gowans, S., Haas, C., Fogleman, A., Michalec, J., MacQueeney, M., & Simard, P. 2016. 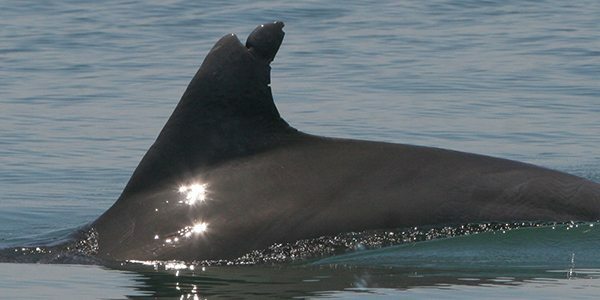 Tampa Bay bottlenose dolphins: long term study to explore the impacts of the Deepwater Horizon oil spill on a relatively distant and protected population. Poster presented at the Gulf of Mexico Oil Spill and Ecosystem Science Conference. Tampa, Florida, February 2016). One of the lesser known marine pollution issues involves the sound created by human activity, from naval sonar to construction to shipping and recreational boating. This has considerable impacts on marine mammals as they are dependent on sound for communication and in the cases of some including the bottlenose dolphin, echolocation (the use of sound pulses to locate and identify objects such as fish or the sea floor). The Dolphin Project recently investigated how bottlenose dolphins change their whistles (their primary type of acoustic communication) in relation to background noise, especially from recreational boats. Most ambient noise in the ocean, including boat noise, is low frequency (or low pitched). 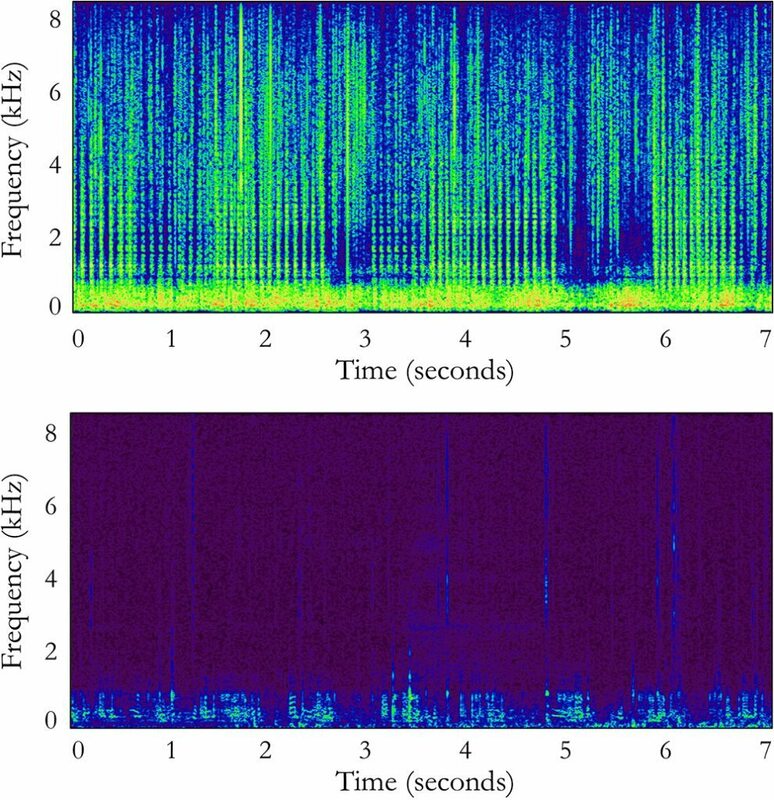 In this study, we found that bottlenose dolphins increased the frequency of their whistles when there was higher levels of ambient noise, presumably to avoid acoustic “masking” of their whistles. The figures above are spectrograms, which we use to visualize sounds. The horizontal (x) axis is time in seconds, the vertical (y) axis is frequency, or “pitch”. The top panel shows two dolphin whistles in low-noise conditions, while the bottom panel shows two whistles in boat noise. Notice that the whistles in boat noise are higher in frequency, harder to see in the spectrogram and harder to hear. Occasionally the Dolphin Project conducts research on other species and other questions regarding the marine environment. Recently, the use of autonomous acoustic recorder data was used to investigate the acoustic soundscape during and after a severe red tide which occurred in 2005. This study found that while biological sounds from snapping shrimp and fish were abundant in the years without the red tide, biological sounds were largely absent during the red tide, suggesting that the red tide had a considerable effect on fish and snapping shrimp abundance or behavior. This research was conducted with Eckerd alumna Kate Indeck (Marine Science 2013) and is published in the journal Royal Society Open Science (Indeck, K. L., Simard, P., Gowans, S., Lowerre-Barbieri, S. & Mann, D. A. 2015. A severe red tide (Tampa Bay, 2005) causes an anomalous decrease in biological sound. Royal Society Open Science 2: 150337). One of the Eckerd’s “resident” dolphins is known as Cupid. Her unique markings of Cupid’s fin make her easy to identify. She was first observed by the Dolphin Project on January 6, 1997, and since that time has had at least three calves. To date, she has been photographed on 135 different occasions by the Dolphin Project. A map of Cupid’s sighting locations since 1997. Bathymetry and landform data courtesy of Florida Fish and Wildlife Conservation Commission. Kim McCallister (Marine Science, 2011) analyzed the home range of Cupid by determining the locations where the dolphin had been photographed by the Eckerd College Dolphin Project. She also used the sighting records of several other adjacent photographic identification projects to the north, south and offshore in the Gulf of Mexico. 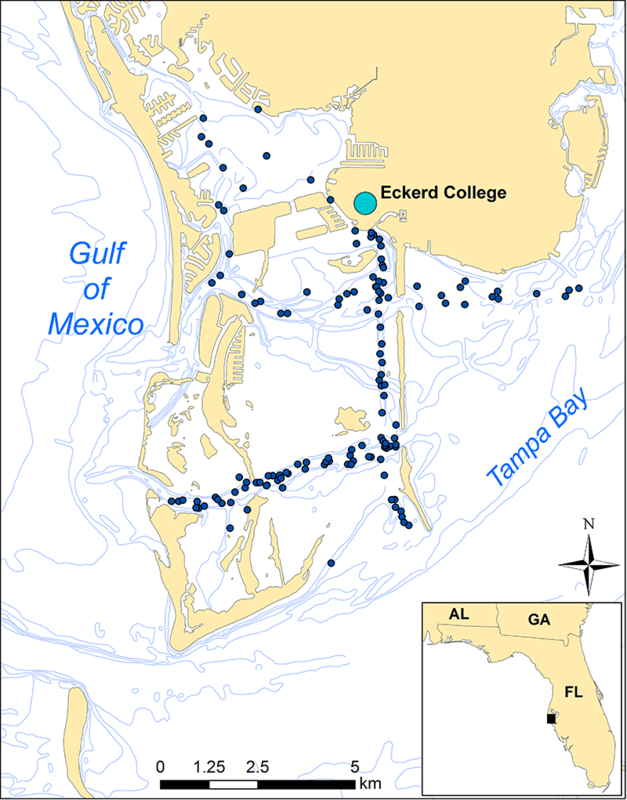 Cupid was found to have a very small home range of only 22 square kilometers (about 8.5 square miles), and had never been observed outside the Eckerd College Dolphin Project study area (McCallister, K. A. 2011. Home range modeling of resident bottlenose dolphins (Tursiops truncatus) in Boca Ciega and Tampa Bay, Florida. Senior thesis, Eckerd College).